Josh Tod training the next generation to take over the family business. 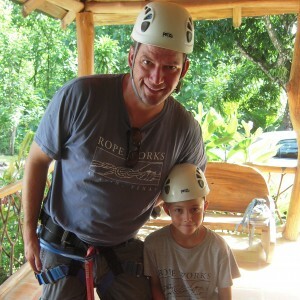 Rope Works has always been a family business, and we consider our customers to be family too. This closeness has led to our unique, “personal builder” approach to customer service. Founded in 1961, Rope Works has been at the forefront of every major leap in technology, training, construction, and industry development. We are multi-generational and multi-talented, and we only employ the finest professionals in the industry. The historical significance of Rope Works is second only to the progressive thinking and futuristic techniques employed by our builders and trainers, a fact we’re extremely proud of. Our President Emeritus, Bobby Tod, is a founding member of the Association for Challenge Course Technology (ACCT) and was instrumental in the development of the ACCT Installation and Inspection Standards. These standards are still in use today and are by far the most widely accepted standards in the United States, providing safety and consistency throughout the industry. Rope Works is proud to be a Professional Vendor Member (PVM) of the Association for Challenge Course Technology (ACCT). Rope Works Inc. is a full-service provider, handling every aspect of course creation, use, and maintenance including consultation, design & engineering, construction, inspections, equipment, and high-quality customized training, program reviews, and services. Every employee of Rope Works is a highly trained professional that is hand-chosen from the industry for their knowledge, skill, style, flair, humor, and of course fashion sense. When you choose Rope Works you’re not just choosing a huge faceless company that treats you like a number – you’re choosing a personalized, hand-tailored experience that will provide you with exactly the outcome you’re looking for. Call us today to find out more about how we can support you.